Bye-bye ice gel packs that only last for 2 hours. The bag is your icepack, and it stays cold for up to 10 hours. Easy! Now it's easy to bring a satisfying, delicious lunch from home, and save hundreds of dollars every year. Packit's not just for lunches. Use it for baby bottles, sports events, travel... anywhere you need to keep items cold. I am not a huge fan of fast food. There are many reasons, and amongst them? The fact that they are not as healthy (and for some reason three quarters of it tends to end up on the floor or the seat when we're eating while on the go in the car). Although we've tried to pack lunch to bring along with us while we're out or on long car trips - the fast melting ice packs and subsequent warm sandwiches are usually off putting enough to just forget the idea all together. I was intrigued to see if the new PackIt Cooler would preserve food as long as it says it does. So when I received it I popped it in the freezer (the cooling element is in the bag itself; no cold pack required!) and packed it with a sandwich and a yogurt.....then left it out of the counter in our kitchen for 8 hrs to test it out (with the cold winter temps I wanted to accurately test it in a warm climate). After the time had passed I opened the bag to find that the food was nearly as cold as it was when I took it out of the refrigerator earlier in the day! I'm excited to take the PackIt along on day trips this Spring/Summer! It will also come in handy when I'm out running errands with the kids; instead of purchasing fast food I can bring some healthy options along with us without worrying that the food will go bad or warm while we're out. A perfect MONEY SAVING alternative for parents and kids on the go! PackIt is like having a portable refrigerator on the go! You can find PackIt at http://www.packit.com/ . For a Limited Time Only when you buy 1 PackIt you'll receive 1 additional PackIt FREE. Keeps food cool for up to 10 HOURS! One Lucky Reader will receive a PackIt in their color/pattern choice! 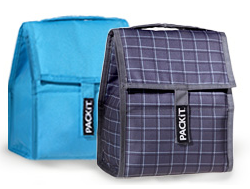 Leave a comment~ Visit http://www.packit.com/ and let me know which PackIt you would love to have. The comment is considered your entry. Entry to this giveaway ends at 12pm PST April 14, 2011. Winner's are chosen randomly through random.org. Winner's may not have won a previous Enjoy Lighting Giveaway. The winner will be announced in a post within 7 days of the giveaway ending, and contacted through email. The winner will have 48 hrs. to respond or another winner will be chosen. I like the solid ice blue one best. I'd love to have the Aqua and I am a public follower via GFC. I Like PackIt on Facebook 1. I Like PackIt on Facebook 2. I Like PackIt on Facebook 3. I Like PackIt on Facebook 4. I Like PackIt on Facebook 5. I Like PackIt on Facebook 6. I Like PackIt on Facebook 7. I Like PackIt on Facebook 8. I Like PackIt on Facebook 9. I Like PackIt on Facebook 10. I follow PackIt on Twitter 1. I follow PackIt on Twitter 2. I follow PackIt on Twitter 3. I follow PackIt on Twitter 4. I follow PackIt on Twitter 5. I follow PackIt on Twitter 6. I follow PackIt on Twitter 7. I follow PackIt on Twitter 8. I follow PackIt on Twitter 9. I follow PackIt on Twitter 10. I entered your tea Collection Clothing Giveaway 1. I entered your tea Collection Clothing Giveaway 2. I entered your tea Collection Clothing Giveaway 3. I entered your tea Collection Clothing Giveaway 4. I entered your tea Collection Clothing Giveaway 5. I entered The Vintage Pearl Giveaway 1. I entered The Vintage Pearl Giveaway 2. I entered The Vintage Pearl Giveaway 3. I entered The Vintage Pearl Giveaway 4. I entered The Vintage Pearl Giveaway 5. I entered your Umi Childrens Shoes Giveaway 1. I entered your Umi Childrens Shoes Giveaway 2. I entered your Umi Childrens Shoes Giveaway 3. I entered your Umi Childrens Shoes Giveaway 4. I entered your Umi Childrens Shoes Giveaway 5. I entered your American Express® Giveaway 1. I entered your American Express® Giveaway 2. I entered your American Express® Giveaway 3. I entered your American Express® Giveaway 4. I entered your American Express® Giveaway 5. I like the polka dot bag.